Like a lot of us on here space is an issue & you can never have Enough Clamps, LOL. I had made this clamp rack back in Dec 09. Sure doesn’t seem that long ago that I made this project. While it was very effective the spacing was a little too wide and not as efficient as I would have liked. Even with the extra beefy hinges there is a little sagging. One day I will rebuild this whole thing out of stronger wood like oak as pine was just what I happened to have extra at the time. Rockler had these metal clamp racks on sale, I have looked at them before and thought they might be worth picking up. While I could make them out of wood, for roughly 12 bucks I figured I would give a cpl a try. I have to say there work great and the spacing is perfect. 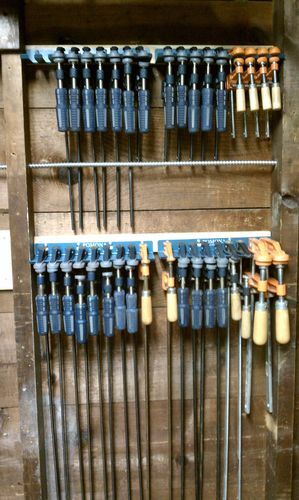 I have stored all my clamps on the rack after redoing 2 of the shelves with the metal brackets. I did have to make to small ones out of wood as my rack was wider than the brackets but no big deal. You might want to ck them out. The only problem is when I buy more clamps will have to change it up some. But that’s a good problem to have. Uhhhhh, I believe the “Racks” are facing the other way… however I’m not complaining. The thing that holds clamps is kewl too; what do that call that again? Thx everyone, Joe I think when I redo mine I will be using a Piano Hinge instead or the regular hinges & I will use oak instead of pine. Even with stiffeners the pine just flexes too much. When I first built this I wasn’t sure how effective or if I would like it so I used pine I had in the shop. But being it has served me well since 09 when I get time I will rebuild the whole thing but I will use these racks from Rockler, saves time from the wood ones I made originally. Sure wish my clamps were set up so neat and tidy looking as yours Ken! Thx so much,,,, They’re neat but notice all the glue on them. I never understood who some Lumberjocks are so clean. Mine are a mess. I think they photo shop there or never use them LOL I’m jealous can you tell. Looks good. Like the others, I wish mine were in that order. . . . . I think they call the tats “tramp stamps”. Don’t ask how I know. Another hot tip. I used these to organize and hang my (primarily HF) clamps. These were originally made to hang probes and test leads for electronics. Very cool, Thx for the info and site. I like it… Always interesting to find other sites people use and what I can get from them. Enjoy the morning. Thanks for the tip. Nice neat storage.